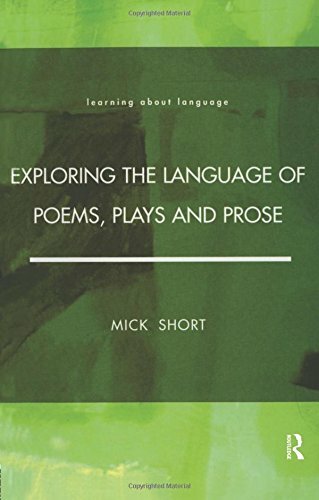 Exploring the Language of Poems, Plays and Prose examines how readers interact with literary works, how they understand and are moved by them. Mick Short considers how meanings and effects are generated in the three major literary genres, carying out stylistic analysis of poetry, drama and prose fiction in turn. He analyses a wide range of extracts from English literature, adopting an accessible approach to the analysis of literary texts which can be applied easily to other texts in English and in other languages. This volume provides a clear and broad-ranging introduction to stylistic analysis - the first to cover all three literary genres in detail. The introduction provides a very useful overview of stylistics as a whole and discusses the links between linguistics and literary criticism. Detailed analysis of each genre follows, with exercises designed to develop ideas further. There is also extended discussion of the exercises and suggestions for further readings for those interested in carrying out their own stylistic analyses. A particularly useful feature of the book is the series of checksheets of style features to look for when analysing texts, which occur at the ends of chapters. This study will be of particular interest to undergraduate students interested in stylistic analysis and the accounts of up-to-date analytical methods will also be relevant to advanced students and researchers.